The bride is the daughter of Mrs. Cheryl Mims Seneker, of Greer, and Mr. Stephen Thomas Sawyer, of Taylors. She is the granddaughter of the late Ruth Weese Mims and Herman Leroy Mims and the late Dalna Whitaker Sawyer and Audley Lee Sawyer. A graduate of Converse College with a Bachelor of Fine Arts degree, the bride is the Art Coordinator for Spartanburg County Public Libraries. The groom is the son of Ms. Joyce Costancia, of Easley, and the late Wilmer Lee Logan. He is the grandson of the late Adeline Brown Logan and A.C. Logan. 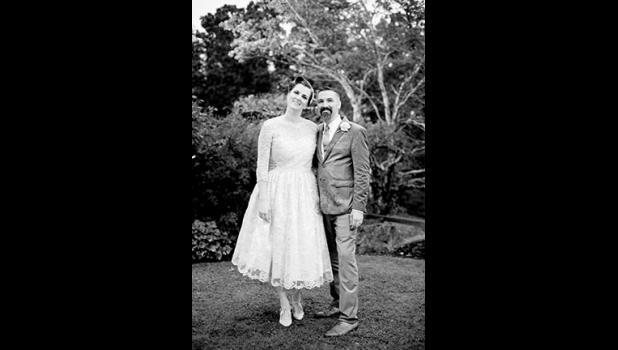 A graduate of Clemson University with a Master of Fine Arts degree, the groom is Associate Professor of Photography at Greenville Technical College. The rehearsal dinner was held at the home of the bride’s mother and step-father, Mr. David Seneker, on October 5, 2017. The wedding ceremony was followed by a dinner, catered by The Green Light Cafe in Asheville, NC, and a dance reception. A vegan cake buffet from Short Street Cakes, also in Asheville, NC, was served, along with a fudge round, peanut butter, and ganache groom’s cake, specially made by the bride for her groom. The bride wore a custom made gown by Julianna Blackmon, designed after her great aunt Sue Weese Coker’s bridal gown worn in 1962. Beautiful light peach galloon lace overlaid an ivory satin gown which fell to tea length. A headpiece made from the lace of the creation completed the ensemble. Sadie Mims Ferguson, niece of the bride, wore a hair piece of the same lace, which also enhanced her flower pouch, made by the bride, which was filled with rose petals. She was joined by her brother, Calvin Steven Ferguson, nephew of the bride, who also served as a flower attendant. The bride’s honor attendants included her sister, Courtney Sawyer Ferguson, and her brother, Nathan Thomas Sawyer. Shanna Wood, Michelle Hood, and Katy Butler served as bridesmaids. Attending the groom as his best man was his brother-in –law, Joel Landers. He was joined by Dusty Landers and Dylan Landers, nephews of the groom, who served as groomsmen. Selected wedding and reception music was rendered by Ms. Hillary Fleming and Mr. Zach Parks, as vocalists. Following a two week honeymoon in Europe, the newlyweds are at home in Inman, SC.